In many of the post-apocalyptic, young-adult novels popular today, society has regressed into a pseudo past-future, where many practices and customs seen in our history are juxtaposed with space-age technology. This theme is a common one, present in bestsellers such as The Hunger Games and the Divergent trilogies. But Mark Murphy takes this theme to a whole new level in his debut, The Curse of the Thrax, book one of his “Bloodsword Trilogy”: the setting takes place so far into the future, it resembles our medieval past. Dragons, magic, polytheism, and prophecy are combined with our cultural and scientific present in a way that creates a post-apocalyptic future so unique it seems like a world of its own. In this way, The Curse of the Thrax has more in common with many of the novels by Tamora Pierce, than those by Collins or Roth. For some reason I always find the fantasy more enticing when a book is set in a world that resembles our own, yet is at the same time its own creation altogether, instead of a dystopian knock-off of real life. I mean, when I want escapism, I want to go all the way away. Despite some flowery and often unnecessarily contrived vocabulary — words like “sonorous,” “plata,” and “ghozim” crop up — Murphy’s writing is just as accessible to young readers as Pierce’s, offering a youthful style that makes reading the story comfortable and exciting. The protagonist, 14-year-old Jaykriss, is a strong role model to young readers in his dedication to his family, his love of his friends, his leadership skills, and his thirst for knowledge. 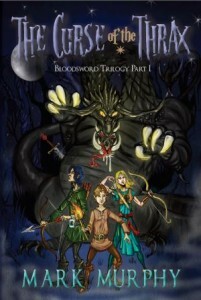 Also packing plenty of action and romance, Mark Murphy’s The Curse of the Thrax is an engaging and exciting read. As always, tell us what you think. Are you a fan of YA fantasy fiction? If so, who is your favorite author? Do you think characters in a novel can serve as role models? Let us know by leaving a comment below. While I can’t say I am a fan of YA Fantasy fiction, I am a fan of Scribbleskiff and it’s myriad of talented writers . In between the occasional wails of my two year old clone, learning Drupal for NYS, and my incessant guitar playing, I have been reading several books. I just finished Tyrannosaur Canyon, by Douglas Preston, which was a pretty good, probably made for TV/Movie soon kind of way. The other book was “Mantle of Command” FDR 1941-1942, which was really informative and concise. My wife has been obsessed with the Deborah Harkness “All Souls” trilogy. She has been deliberately taking her time on the “Shadow of Night”, which is the last book in the trilogy. I am not sure if that author or trilogy falls in YA Fantasy fiction. She does rave about the author.